Nine series of Booster Packs. Packs follow a color pattern. A Booster Pack (Japanese: ブースターパック　Būsutāpakku; Chinese: 擴充包 Kuòchōngbāo "Expansion Pack") is a pack of Yu-Gi-Oh! cards from one of the Booster Sets, the main sets from where new cards are released. 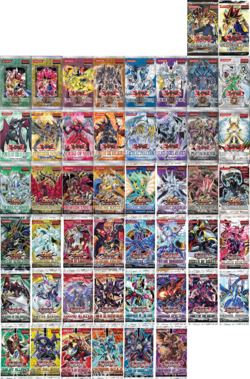 OCG Booster Packs contain 5 cards each, whereas TCG packs contain 9 cards. Booster Packs can be bought at most game stores and at some general/department stores. In the TCG, each main series Booster Pack is guaranteed a Rare, 7 Commons, and a ninth card which will either be another Common or a foil card (Super Rare rarity or higher). As of Breakers of Shadow, the ninth card is guaranteed to be at least a Super Rare, with a 1:6 chance of it being an Ultra Rare and a 1:12 chance of it being a Secret Rare. This also applies to side series sets such as High-Speed Riders and Wing Raiders. Previously, the chances of a single pack containing a Super Rare was 1:5, with Ultra Rare and Secret Rare chances being 1:12 and 1:23; in some older historical sets, the latter two chances were 1:24 and 1:31 instead. OCG Booster Pack rarity ratios are currently undocumented. In video games, player can purchase a Booster Pack by defeating an opponent (e.g. Yu-Gi-Oh! The Eternal Duelist Soul) or by buying them in a store in-game (e.g. Yu-Gi-Oh! Tag Force).